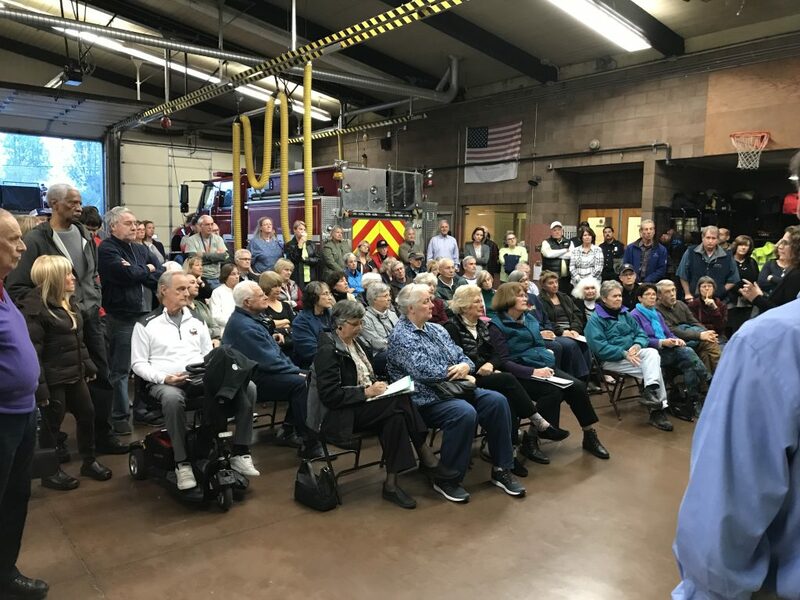 Between 100 and 150 community members jammed the East Davis Fire House Wednesday evening from 5:00 pm to 7:00 pm. Fifty of the community were provided seats, but the rest of the attendees were forced to stand. The lucky 50 who got seats, or in the case of George Hague, former Planning Commissioner, who brought his own. Acting Fire Chief Dennis Reilly. Councilmember Frerichs trying to maintain audience decorum. 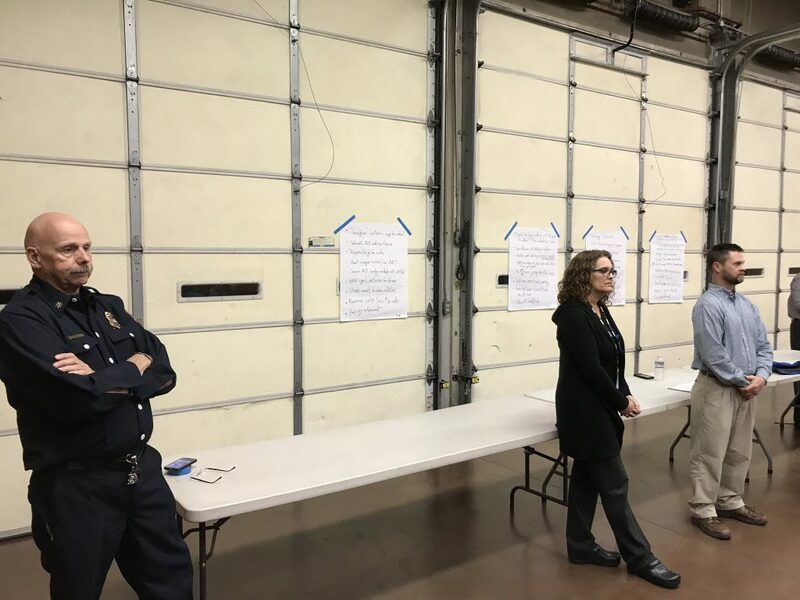 After a brief, and contentious, overview presentation by Mayor Lee and Brian Mickelson, close to 50 questions were taken from the audience, many of which were written on flip chart sheets and taped to the wall of the fire house. A handful of the questions recorded by City Staff. 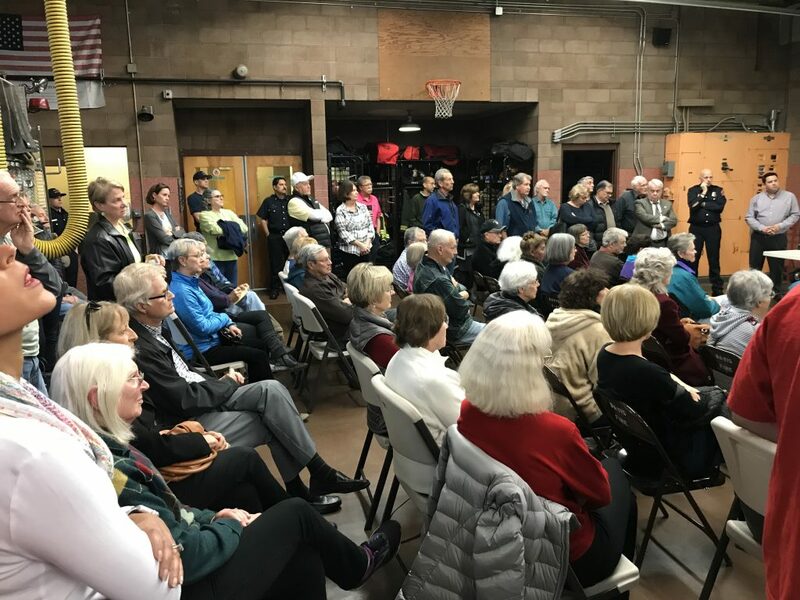 Acting Fire Chief Reilly responded to the fire safety concerns by noting that the concerns identified are not as bad as other places he has dealt with in his 44-year fire career. He noted that his experience is that once sirens and bull horns start blaring people and vehicles do get out of the way, even in the face of the tight quarters that the newly constructed concrete barriers create. Acting Fire Chief Dennis Reilly fielding audience questions about impact on public safety. Mayor Lee and Councilmember Frerichs assured the assembled multitude that they would provide answers to the questions they had heard. Mayor Lee assuring audience that their questions will be answered by the City. For those who submit their questions here on there Vanguard or on Next-door, I will confirm that your question is actually in the list recorded by the City at the meeting, or is added to their list if it is not there. About one-third of the standing portion of the attendees. Another third of the standees. Matt Williams has been a resident of Davis/El Macero since 1998. 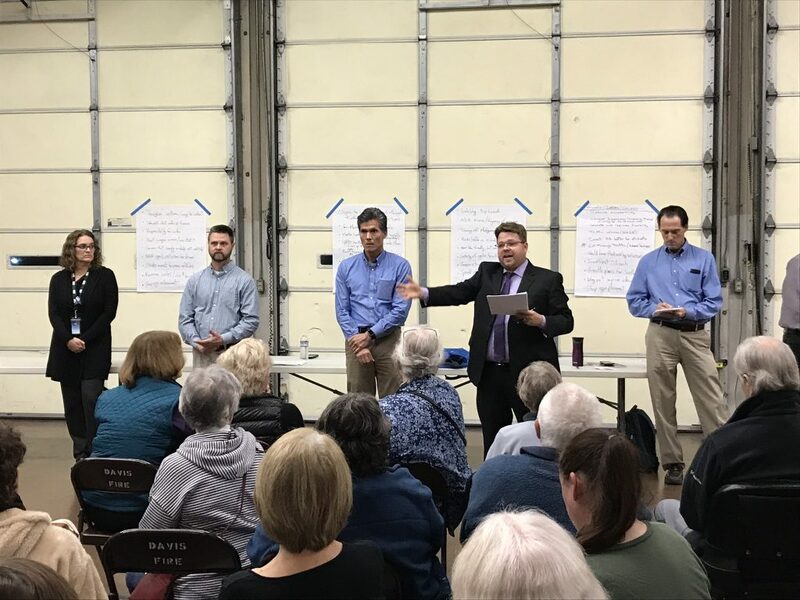 Matt is Chair of the Finance and Budget Commission of the City of Davis (FBC), and a member of the Downtown Plan Advisory Committee (DPAC) and Broadband Advisory Task Force (BATF), as well as Treasurer of Davis Community Network (DCN). He is a past Treasurer of the Senior Citizens of Davis, and past member of the Finance Committee of the Davis Art Center, the Editorial Board of the Davis Vanguard, Yolo County's South Davis General Plan Citizens Advisory Committee, the Davis School District's 7-11 Committee for Nugget Fields, the Yolo County Health Council and the City of Davis Water Advisory Committee and Natural Resources Commission. His undergraduate degree is from Cornell University and his MBA is from the Wharton School of the University of Pennsylvania. He spent over 30 years planning, developing, delivering and leading bottom-line focused strategies in the management of healthcare practice, healthcare finance, and healthcare technology, as well municipal finance. The city of Davis for the last several months has been working on road repairs and upgrading the intersection of Mace and Cowell. The city received a $3 million grant from SACOG to pay for improvements to bike and pedestrian safety, while at the same time getting money to resurface Mace Blvd. 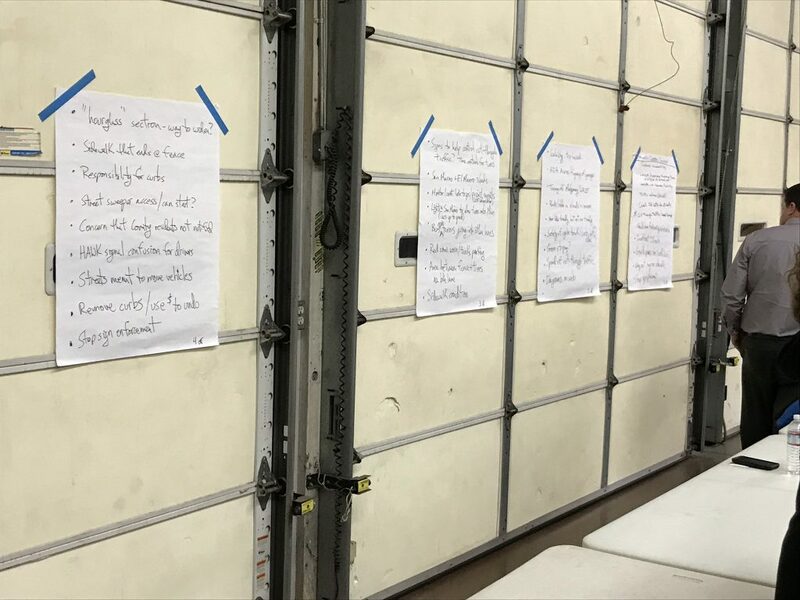 Last week the council received some complaints and the city had scheduled the meeting for Tuesday night to hear community concerns and talk about the project. Complaints range from the fact that the construction has taken too long, traffic impacts, and the shrinking of lanes from five (two travel lanes each direction and one turn lane at traffic lights) down to three (one travel lane each direction and one turn lane at traffic lights). There is a broader problem having to do with Friday traffic that backs up from I-80 to the surface streets impacting traffic as well. On core of the problem: many residents have expressed frustration over increased travel times and questioned whether the changes have really made anything safer. I was there and would estimate there were closer to 100. 40 chairs were set out and about twice that standing, still, a very good turnout. When asked for a show of hands to indicate which neighborhoods were represented, there were about 12 to 15 people from Pioneer Park neighborhood, about 10 to 12 signaled they were from Woodbridge, and about 10 indicated they were from Willowbank with one from Slide Hill Park. The vast majority, 50 to 60, were from El Macero. The crowd was animated, as they say. Given the level of emotion, the meeting went pretty well in terms of hearing from everyone who had their hand up to speak or ask questions. Statements and assertions far outnumbered questions as is to be expected when people are angry. I think the city staff did a great job of getting those concerns down on paper whether they were in the form of a question or a statement. 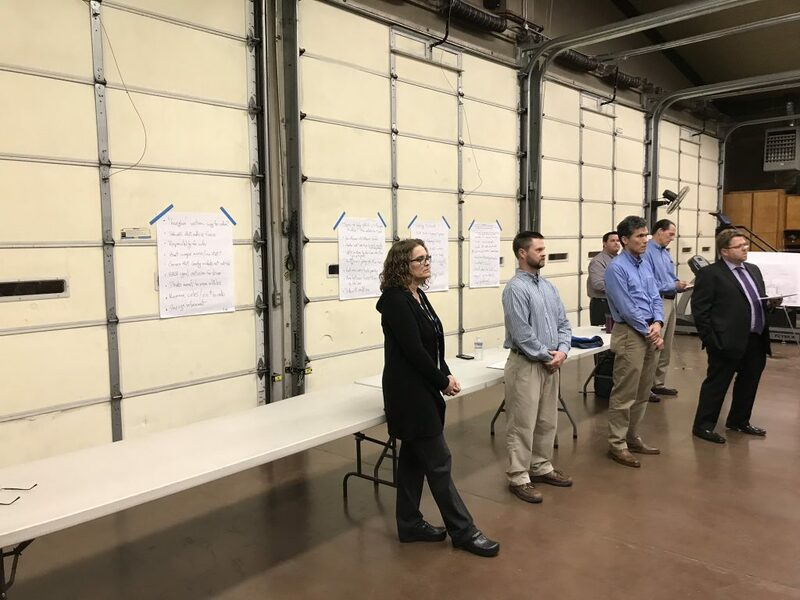 One other observation is that the crowd was pretty good at working within the structure of the meeting, though there were some who would blurt out rejoinders while others were waiting their turn to speak. One has to consider that very few people these days are used to working as equals within organizations with high levels of internal conflict and are thus unaccustomed to taking their turn and respecting others’ rights to an orderly process. With a few more hotheads in the audience, the meeting could have easily spun out of control and been of no use to anybody. So, kudos to City Manager Mike Webb and our two council members Brett Lee and Lucas Frerichs who kept things moving in a constructive direction. I counted 5 rows of 10 chairs apiece, then 25 standing on each side and 10 in the back. Dave and I are very close, and the difference doesn’t really matter. Good turnout either way. I second all the points Dave makes in his third paragraph. There were two issues that resonated quite a bit with the attendees, and definitely pushed them right up to the brink. The first was the assertions of staff and the Mayor (Lucas had not arrived yet) that the City had sent notices to the affected parties. One of the people who spoke to me was the owner of the office building at the corner of Mace and Cowell (diagonally across the street from the Fire House). He was adamant that he was never sent any notice, either in mail, electronically, or by phone. Based on the shouted comments, the City may also not have noticed any County residents (e.g. in El Macero and Willowbank). 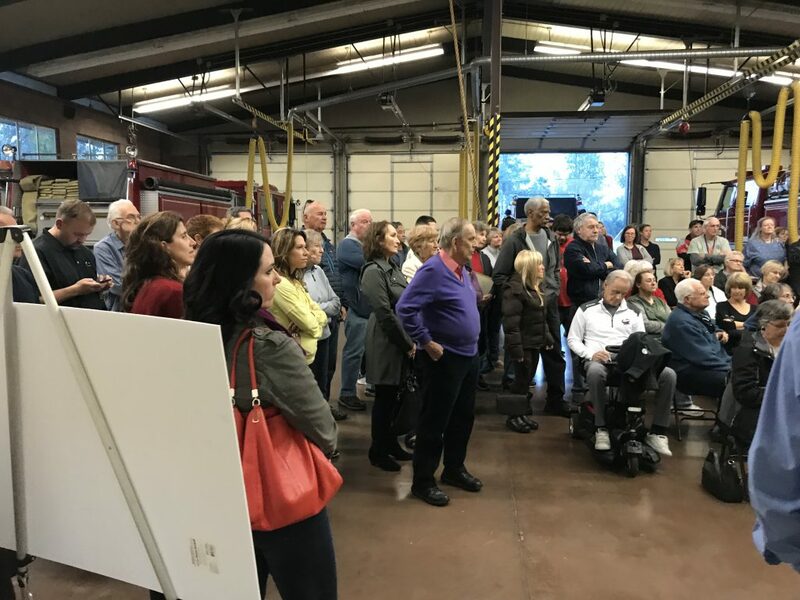 The absolute high point in the meeting for me was after a series of individuals were making the point that the city should bring out jack hammers, no other action was acceptable and if the city council members would not commit to that before the meeting was over, then it was time to mount a recall. A woman who had previously given a very angry series of comments stepped up and pointed out that with her own background in construction, she understood that the project was nearly complete and that trying to halt it and stop all further construction activity was not reasonable or even desirable. The construction company would have a great lawsuit against the city and so the net cost of stopping construction and ripping it all out would be far more expensive than letting it be completed. That really helped get the meeting back into the realm of reality. That’s what I think of when I imagine democratic action in our community.